democracy, principled statesman, brilliant legislator, civil libertarian and fearless militant against oppression, be it the Japanese fascist invaders or the homegrown fascist dictator Marcos. I am proud to have personally known Senator Tañada since he delivered the keynote speech at the founding of Kabataang Makabayan (KM) on November 30, 1964. He exhorted us to emulate Andres Bonifacio and the Katipunan and to continue the unfinished Philippine revolution. I worked closely with him under his chairmanship of the committee that prepared the founding of the Movement for the Advancement of Nationalism (MAN) in 1966 and even more closely after the founding congress elected him as MAN chairman and myself as general secretary on February 8, 1967. I am thankful for the inspiration, knowledge and experience that I gained from working with Senator Tañada in MAN under his leadership. He was a man of high intellect and deep conviction. He was always serious and meticulous in examining drafts and possible courses of action. I remember fondly the council meetings and the informal meetings where we would exchange views and he would often arrive ahead of everyone else at the effectively exact phrase in meaning and nuance to persuade people within the nationalist or anti-imperialist context. He was always supportive of the mass actions to express protest and make demands against US imperialism and the servile government. assaults of the armed personnel of the state. 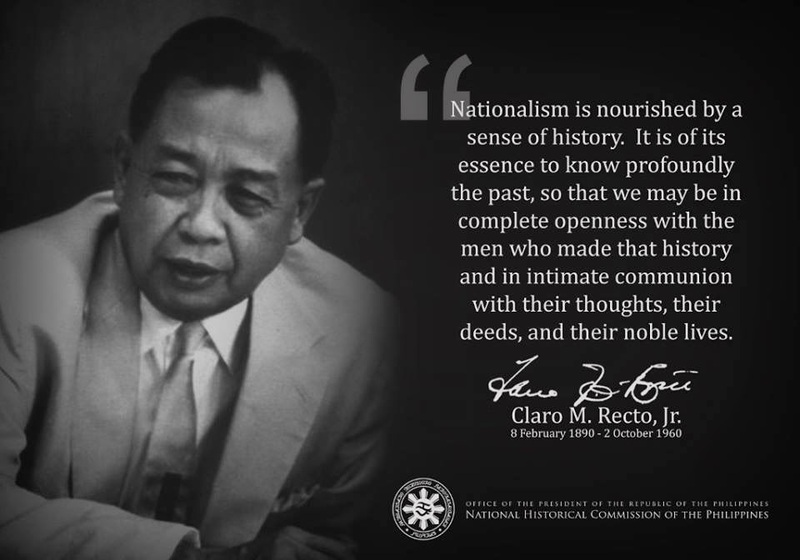 Like everyone else in the national democratic movement, I admired his leadership in a series of alliances (especially BAYAN of which he was the founding chairman) and his active participation in indoor and outdoor rallies and other forms of activities for the purpose of seeking the end of the Marcos dictatorship. He delivered powerful messages to denounce the criminal acts of the regime and to inspire the people to resist. It is of high and urgent importance to celebrate and seek guidance from the great legacy that Senator Tañada has bequeathed to us all. We need to refresh and revitalize ourselves with the principles that he enunciated so lucidly and so vigorously and with the actions that he undertook and made him an exemplary fighter for the national and democratic rights and interests of the people. US imperialism, extremely corrupt and exploitative and unrestrained in repressing the people and committing human rights violations. Senator Tañada had a high standard of morality for both private life and public service. He espoused and practised the clean and honest service to the people which he required of all government officials. As senator, he first became well known as a crusader against graft and corruption. We are obliged by his teachings and example to fight uncompromisingly against a regime that has prolonged itself through electoral fraud and whose corruption knows no limits. The Arroyo regime has no moral and legitimate basis whatsoever. Senator Tañada stood for the economic sovereignty of the people, the conservation of our national patrimony and the development of the country through national industrialization and land reform. We are required by his teachings and example to fight relentlessly against the US-imposed policy of "free market" globalization. This is a tricky phrase for obscuring the reality of monopoly capitalism and favoring the US and other multinational firms and banks through the denationalization of our economy, liberalization, privatization and deregulation. and to conjure the false illusion of economic growth. The dumping of surplus manufactures and agricultural products from abroad has ruined local production and has made the country a victim of manipulated shortages and price gouging by foreign monopolies. The people are suffering terribly from the rising debt and tax burden, the rapid increase of unemployment, the plunging level of income, the soaring prices of fuel, food and other basic commodities and the rising fees for deteriorating basic social services. The Arroyo regime does not offer any kind of solution or even mere alleviation to the suffering people. It is now floundering due to the international credit crunch and lower orders for the kind of exports that the Philippine makes. It is obsessed with raising the tax burden in an economy that is already bankrupt and depressed. when the 1987 constitution prohibited the basing of foreign military forces and the introduction of nuclear, chemical and biological weapons of mass destruction. He was elated when in September 1991 the Philippine Senate passed the resolution terminating the US-RP Military Bases Agreement. sovereignty and territorial integrity. The Arroyo regime has been the worst in treasonously increasing the pretexts for US military intervention and for actually allowing the continuous and increasing presence of US military forces in the Philippines. Under the guise of combating terrorism, the US policy of "global war on terror" has whipped up war hysteria and war production in the US, wars of aggression against Iraq and Afghanistan, repressive laws and state terrorism on a global scale. The Arroyo regime has followed the policy not only in abject subservience to its imperialist master but also in pursuit of its selfish interest in getting US blessings and some amount of military assistance and in using the military and police forces to keep it in power, to suppress the patriotic and progressive forces and intimidate the broad array of opposition forces and the broad masses of the people. revolutionary movement with the so-called military solution, Oplan Bantay Laya I and II, have failed but have only succeeded in rousing revolutionary resistance and paralyzing the GRP-NDFP peace negotiations. We must overcome the impediments to the resumption of the peace negotiations. If we cannot resume the negotiations during the Arroyo regime, we must prepare for doing so after this regime. We must strive to achieve a just and lasting peace by addressing the roots of the armed conflict and agreeing on the social, economic and political reforms that must be undertaken. independent, democratic, socially just, prosperous and peaceful. May the wisdom of Senator Tañada continue to enlighten and inspire us. His teachings and his deeds are relevant to the understanding of our problems and to the solutions that we can undertake as a nation. Let us summon the memory of the great patriot Senator Tañada clenching his fist to defy the reign of greed and terror and signal the people to rise up and exercise their power against their adversary.